My latest obsession on my phone is the Overdrive App. This is the fault of one my co-workers (Amy you know who you are). I was using Audible, and I love Audible – if there is a book that I want to keep, that I want to listen to more than once, or once a year, I will be getting those from Audibble so that there is no waiting line when I want to listen to them. That all being said, Overdrive has become the second most used app on my phone next to BeyondPod – which is what I use for podcasts. 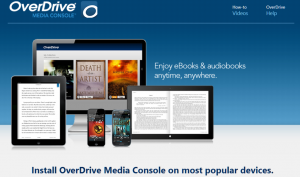 Overdrive is a connection between your local library and your digital life. This app delivers ebooks and audio books to your phone, tablet, whatever so that you can enjoy them. It will even allow you t stream videos that are available at your local library. We live in a wonderful age. With our lifestyles, go go go and all that, it is at times hard to find time to sit down and read. With audiobooks and ebooks, you can always have literature at your fingertips, in your pocket, on your phone. Go to your local library and get a library card – I know what you are saying. I have to actually go interact with people and get a physical piece of paper to check out books? But I don’t like people and buildings full of books are so last century. Trust me this is the only time that I am going to ask you to go out and be around people – at least in this article. Download the App – I use it on Android, but it is available for both. Connect your copy of Overdrive to your local library system (for me it is Tennessee READS). You will need your library card number for this. After you put it in once, it will remember the number. That being said keep track of your library card in case you ever get a new phone. I know, no one ever upgrades their phone anymore. No you are ready to start looking for your first book the format is up to you. That is it. Really easy. And it is free. Free library card, free app, free books. Crazy that we can now use the library system on our phones. The only draw back that I have found is that this app works just like the library system. Let me explain. The Overdrive App works just like your local library and the books, whatever format, that are available on the app depend on if they are actually available or not. If someone has already borrowed the book, digitally checked it out, then you can’t check it out right then. You can get on the waiting list and they will let you know with a notification when the book is available. You then check it out for 7 days and have that amount f time to listen to it or read it. Overdrive supports all manner of ereader, so finding your version is easily done. For audiobooks, you can download their version or stream it from the app. The download sits on your phone while you are listening to it, in a separate app, saves your place and allows you to jump back into your spot in the book at a moments notice. This app has gotten me reading a again. When at work, if I am running though reports or getting payroll together you can bet I am either listen to a book or a podcast. They daily commute has become a time of reading due to always having an ebook on hand. And due to the fact that sometimes I am waiting for the next thing on my growing reading list, I am discovering new books that I didn’t even know I wanted to read. Check out Overdrive and get back into a good book.